Agilent Technologies introduces the 53200 series RF and universal frequency counter/timer series, one of the earliest frequency counters with LXI Class C compliance. The 53200 series frequency counters feature industry-leading performance and usability, and are built with standard computing I/O for ease of connectivity and data collection. The combination of high-speed measurement and built-in analysis provides new functionality previously unavailable in basic frequency counters/timers. 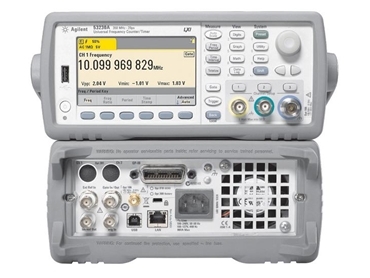 Agilent 53200 series RF and universal frequency counter/timer series offers base bandwidth of 350 MHz with options to extend up to 15 GHz. Measurement reading speed has increased by more than two orders of magnitude from the previous generation of frequency counters. The 53200 offers resolution performance up to 12 digits/second continuous-count gap-free frequency resolution and 20 pico-second single-shot time interval resolution. Advanced math and statistical information including basic modulation domain analysis (MDA), simple jitter analysis, Allan deviation and histograms allow engineers in design and manufacturing to view the history of their measurements quickly as well as see the quality and performance of their signal. The 53200's optional battery supports remote usage and maintenance of accurate measurements by keeping the timebase warm at all times. The 53200 series is SCPI compatible with Agilent's current generation of RF/universal frequency counters (53131A, 53132A and 53181A). An optional GPIB interface is available to meet any legacy system compatibility requirements.